The average North American house size in the 1950s was 800 sq ft. According to BBC, today, that average is 2300 sq ft...and just because that's the average, it doesn't mean there aren't millions who quickly “outgrow” 2300 sq ft and seek homes in the neighbourhood of 5000 sq ft. Several online writers with an interest in this area have attributed swelling house sizes to both a forgetfulness in how to maximize any given space's utility, and an accumulation of “stuff” that our predecessors just weren't laden with. Not everyone can, or wants to, keep up with that growing house size. Taking care of a larger property means spending more time and money than our ancestors ever did on their homes, which consequently means less time and money to pursue interests and hobbies. Not surprisingly then, resentment towards this phenomenon has given rise to a movement determined to counter that. All you need to do to see this for yourself is google a phrase like “small space living,” and you'll be greeted by the plethora of blogs and websites devoted to helping people make this a reality. It doesn't stop with returning to the 800 sq ft of the 50s. The community of those who are genuinely excited by the prospect of living “small” is full of people who want to push the limits of this kind of lifestyle. Some aspire to live—with spouse and child—in spaces as small as 400 sq ft...and some are trying to go even further, and live in portable homes as little as 100 sq ft. Can you imagine all the cleaning that wouldn't need to be done for a home like that? You might wonder if this movement is only drawing the ultra bohemian—those who don't have jobs and friends to entertain. Surprisingly, that isn't the case. 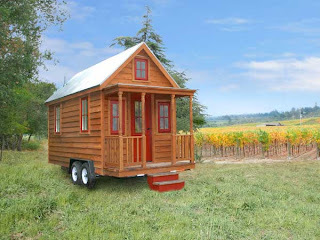 In fact, there are families in the midst of raising children who are giving the tiny home a go. And these homes are a far cry from dowdy old RVs set up in sketchy parks. People with land are doing this, and they're doing it with style. 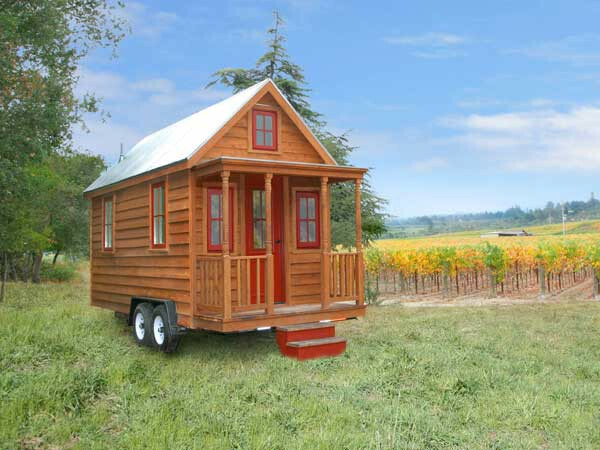 The home pictured above is an example of a design by Tumbleweed Houses, whose plans range from 100 sq ft to just over 800 sq ft.
Of course, there are concerns relating to stability: how do you ensure that you're covered if anything happens to your mobile home? Well, the good news is that just as a standard house is insured by home insurance, there are mobile home policies that protect your mobile home, as well as other structures on your land (garages, sheds). This coverage protects against things like fires, windstorm damage, lightening, and several other disasters. So if you're daring enough to try extreme downsizing, you don't have to forgo peace of mind! Making this decision is not without its challenges, and it certainly isn't for everyone, but if it's something you've wanted to try, and if you're intimidated by trying to figure out where to begin, start small (fitting advice, isn't it? ): borrow books from the library on minimalism, and create a list of blogs that you find helpful in demystifying small spaces. And above all, have fun.